Reclusive author M.M. Banning, Mimi to her friends, values her privacy. Years ago, she wrote a novel that became a literary phenomenon. She reaped the financial rewards of the novel and lived a life of blissful anonymity. But all of that changed when Mimi found herself the victim of a Bernie Madoff style scheme. In order to climb out of the massive financial hole that she finds herself in, Mimi will try to make lightning strike again. She has to write a new novel, and she has to do it fast! Banning's publisher is excited to learn of the author's plans. After publishing her first book all those years ago, they'e been waiting not so patiently in the wings for a new one. Naturally, they aren't taking any chances with this sophomore effort. They'll do anything in their power to ensure the next M.M. Banning novel arrives without a hitch. Twenty four-year-old Alice, a publishing assistant, has been assigned the unenviable task of living with the novelist to make sure the new work comes to fruition. When Alice arrives at the secretive Banning estate, she is greeted with hostility by the reclusive author who does not appreciate a new person invading her life. Alice is also surprised to learn that Mimi is the mother to a young child, Frank. Frank is a peculiar character in his own right. Everything about the boy seems to be inspired by a bygone era. He is dressed in a suit and speaks as if he's been transplanted from a scene in Casablanca. As Alice begins her residence with the Bannings, she must learns to cope with their eccentricities and become part of Mimi's daunting effort to save her family in the only way she knows how. From start to finish, Be Frank With Me is an absolute delight. The story takes a classic fish out of water scenario and evolves it into a sometimes comedic, sometimes tragic, but always engrossing character study. As I read, I couldn't help but draw comparisons between the fictional Mimi and Harper Lee. While I hesitate to say Claiborne Johnson was inspired by the real life solitude of Lee, it is hard not to see the similarities. Still, it is Frank who truly captured my imagination in this one. As he reveals himself to Alice, I couldn't help but feel sorry for him. His childhood innocence is slowly eroding away as he realizes that he does not fit into the world outside of the one his mother created for him. 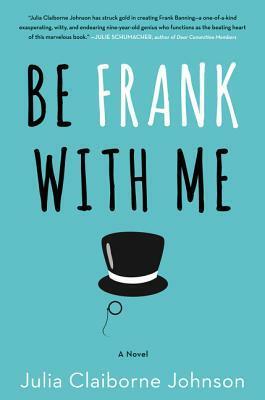 In the end, Be Frank With Me is a charming novel that questions the expectations that society places on itself. This entry was posted on Wednesday, June 29, 2016 and is filed under Be Frank With Me,Family,Fiction,Julia Claiborne Johnson. You can follow any responses to this entry through the RSS 2.0. You can leave a response. This sounds delightful and I love the comparisons you drew to Harper Lee. Thanks for putting this tale on radar! You're welcome! It is such a gem!